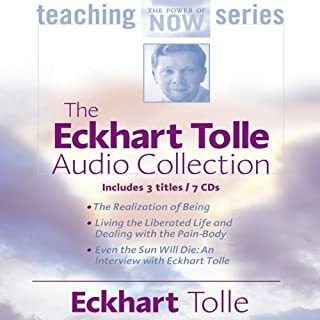 These short, clear entries are organized into ten topic clusters ranging from "Stillness and Silence" and "Beyond the Thinking Mind" to "Relationships" and "Suffering and the End of Suffering." Whether listened to individually or in topic clusters, these entries take on a rare transformative power. While its message is broad and profound, Stillness Speaks is also highly practical. 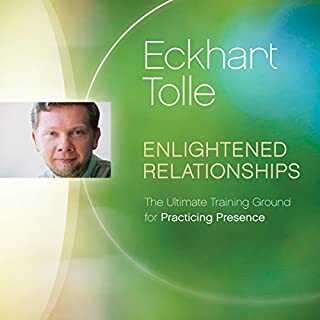 Eckhart Tolle shows us how to be with another in a relationship that can contain and weather all things, how to sit with a dying person, where to find wisdom, how to free ourselves of guilt, and how to control our constant stream of thoughts. Underneath the words, and in the spaces between them, we find the power of stillness, a vibrantly alive state existing only in the present moment. Stillness Speaks draws upon the essence of all spiritual traditions, offering a message that is both ancient and contemporary, filled with timely and powerful wisdom. This book - I now realise - is why I joined audible. 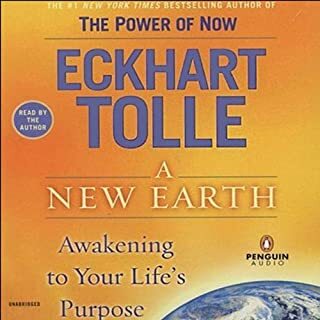 The coming together of Tolle's perfectly clear wisdom (the power of NOW), the miracle of mp3 and the pause button on my iPod to create a life-changing experience that I take everywhere with me at the moment. 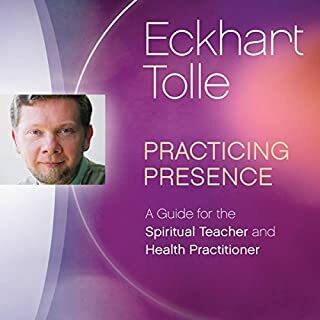 The pace Tolle reads is perfect, especially precious being the long contemplative pauses he uses to allow profound things to settle and the ripples to spread outwards. He invites us to stop 'reading' regularly and take more time away from the book than with it - a strange invitation that makes perfect sense the longer you live with this teaching. And that's why I'm in awe of this technology; a little solid state thing hanging round my neck; no moving parts and weighing almost nothing. Consuming almost no power; able to stop and let the learning take hold and restart at any time later - when the time is right. Worth every penny of my entire year's audible subscription. 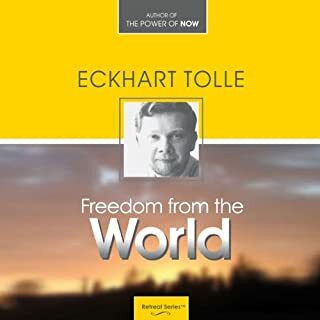 Although much shorter and suffused with such lengths of silence that one wonders what exactly has been said, I found this to be more powerful than Eckhart Tolle's first book (which itself was brilliant). 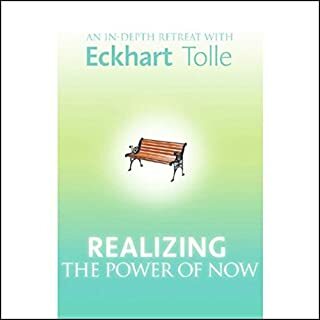 His original 'The Power of Now' was marred by the inclusion of an alluring but nonetheless unfalsifiable Eastern metaphysics. Tolle -almost- does what he says in the introduction: he presents a message that one already knows deep within oneself. 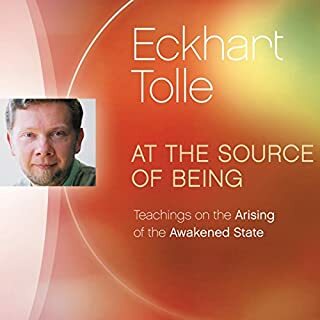 I trust the listener will be discerning enough to recognize when Tolle unwittingly stops being a spiritual teacher and takes on the role of religious preacher. Thankfully, in this, his second book, he is less of the latter and more of the former. 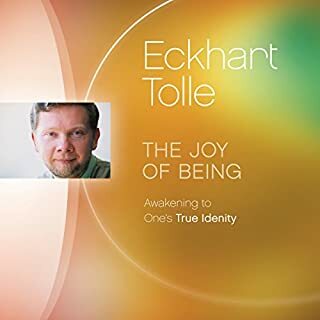 Eckhart talks in such a way that I have been able to realize and finally experience the feelings of awakening that I've wanted for so long. He has a way with words that is clear, understandable and works. Transformative in his profound teachings - each 'thought' followed by a gap to give the listener the time to digest or pause the reading to contemplate. 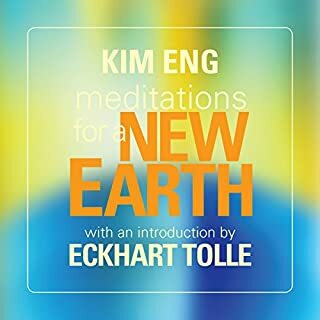 Though his advise is to stop the reading as often as possible so as to maintain the connection with the current moment, I enjoyed the content so much I listened to it several times non stop. I recommend wholeheartedly. 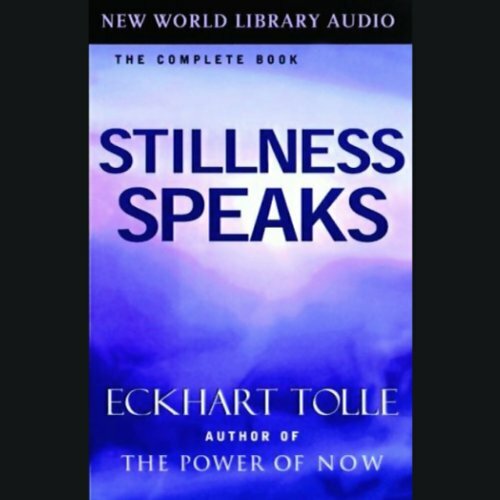 Would you consider the audio edition of Stillness Speaks to be better than the print version? Profound wisdom and insight in all his writing . 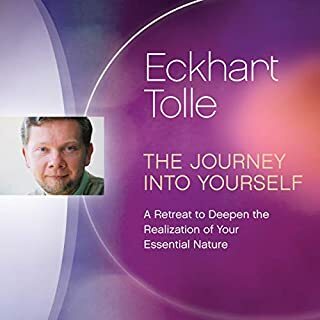 Eckhart helps you find your way back home .Highly recommended . 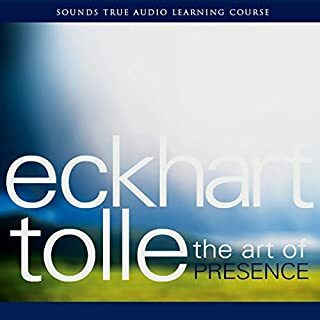 One of the best books by Eckhart Tolle. Gets right to the point and in a lot of ways is better than the power of now. Please, buy this book, you won't regret it! This stuff should br taught in schools. A lovely creation by Tolle. Small snippets that cut through the day to day and bring you peace and clarity. This is an audiobook I listen to a little piece of every day. I found this extremely provoking. It's like being reminded of something profoundly true that I had forgotten. I have listened to it over and over. It is my go to sanctuary. The pace is superb with gaps between sections to allow stillness or to allow the ideas to be 'grappled' with. It is beautifully calming. It is impossible to argue with and whenever I listen to it, I always feel better. There is something very rare and magical about this. I recommend it to any fellow person with my whole heart.. I listen to this book frequently. The concise phraseology is so apt and hits right to the core. 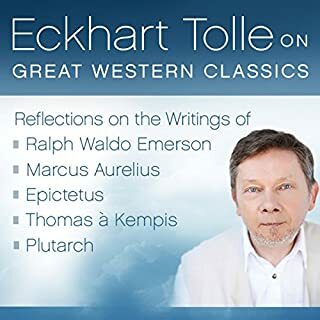 Ekhart's voice possesses tranquil, calming qualities. Coupled with the silent gaps and pausing, the effect easily assists one into self reality and a temporary cessation of thinking. The audio version has a more profound effect for me personally. 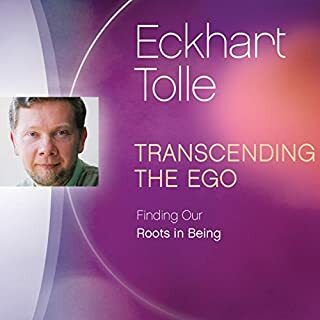 The 10 short chapters appear as a summary of Ekhart's work, the essence of being. A masterpiece. 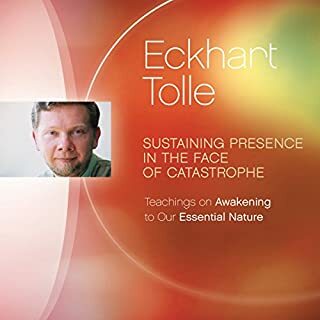 Echart Tolle came into my life purely by accident when I ordered a Netflix Video series called Flowering of the Human Conscience by Eckhart Tolle whom I had never heard of. I was expecting something very different. I am beginning to wonder if there was some other force working to help put me on the right track, because I would not have had any reason to rent this DVD disc series. I had only been renting workout videos for the past several weeks. When I stuck it in the DVD player, I saw a simple looking man stepped onto the stage and started talking. My first thought was, oh lord, what the heck did I get myself into here, but after 5 minutes I was captivated, and was blown away by the simple yet powerful message. I was not looking for spiritual direction, but got it non-the-less and in a very enlightening way. I have to date purchased 4 of his audio books, and my life has been changed forever in a gloriously calming way. I am eternally grateful for this chance meeting with Mr. Tolle,and his life-changing message about the meaning of life. Read "The Power of Now" first and this book second. If you liked TPN you will love this. It is full of great meditative insites that will help you have inner peace and enjoy the path to enlitenment. Good to pause after the verses in order to fully take in the teachings. Absolutely breathtaking if you are ready for it. 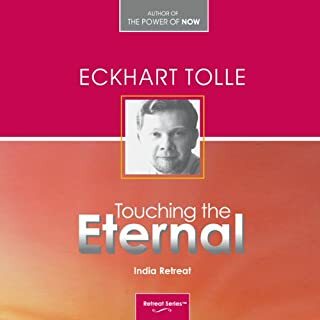 Thank you Eckhart. I probably would not have had time to read this book but audio makes it so easy now to be exposed to different material. Very well done with great insight. Really had me thinking. "Not a book to be read from cover to cover, but to be pondered, and read again and again" Loosely a quote from the book and so true. I never tire of this book. 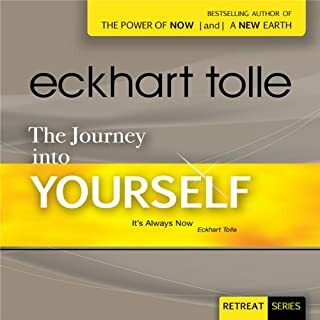 All the genius and wisdom of Tolle, in bite-size yet profound pieces. "Stillness speaks" is indeed short, as compared to "The Power of Now". Yet it is good, concise summary of Tolle ideas. In some sense it is about one idea, that is elaborated deeply in both of his books. This simple idea can be expressed in saying: "We are not our minds". Tolle rediscovers truths known to almost all great meditative traditions of all religions, to tell, in simple words, that beyond and below our discursive and noisy stream of thought, there IS certain realm, that exists, but which existence is of different dimension than the existence of forms in this world. Yet this simple idea is fruitful and deep. 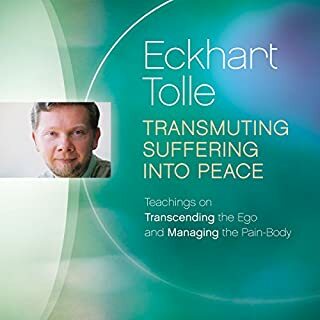 Tolle elaborates on it, and the consequence are far reaching, from appreciation of meditative practice, through betterment of our relations, to the overcoming of suffering and death. As I stressed in my two previous reviews, the true value of Tolle is in his simple language, modest approach to difficult problems and intellectual honesty. So don't expect here cryptic expression of some mysterious truths. This book is about things of common life and common experience - that are, as it often happens, concealed by our talkative and blusterous culture. Eric's voice and use of silence is piercing in truth, and awaken parts of me that have been waiting to be spoken to. I reconized my true identity as Soul, eternal. I could not help but feel good, for he showed me how to have compassion for myself, allowing my natural spiritual state to come to be, free! This book is filled with great wisdom about what occurs when we allow stillness to speak. 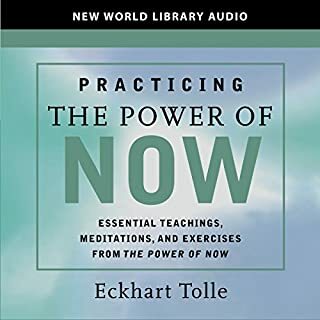 I have not listened to the entire book because I have read practicing the now twice and bought both books at the same time, I am leaning more towards the practicing but only because it is helping me to rid myself of ego and pain body and living the power of now! My husband is particulary happy about this change! Delivers a quiet inside mometary awaraness about oneself which is all we have. An awakening self in the monents and enjoyment of each one of them.